Cheerleaders in junior high should be taught middle school cheers that are appropriate, simple and easily transferable from one sport to another. Most middle school squads include a mix of cheerleaders with prior experience and those without. Keeping the cheers simple will help all the cheerleaders focus on learning and perfecting the fundamental skills of cheerleading. Most middle school cheer squads will cheer during pep rallies, basketball games and football games. Start by teaching your squad a Hello Cheer and a few generic cheers for team spirit that can be transferred easily between sporting events. (All other cheerleaders respond) "Yeah!" And I'm a _________________(enter your mascot)! (All other cheerleaders respond) "All right, all right, all right!" Once the cheerleaders get the hang of the basic cheer, encourage them each to perform a jump or a stunt before introducing themselves to the crowd. 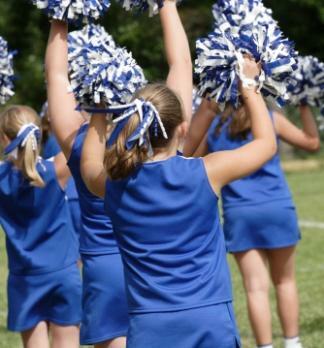 If your middle school has a school song or a fight song, the cheerleading squad should be prepared to lead the fans in the song after games or during pep rallies. Many schools incorporate standardized cheer motions into the song's delivery, while other schools will only require cheerleaders to hold their poms in the air while leading the song. If your school's song doesn't already have standardized cheer motions, you could ask your cheer squad to work together to develop motions to the song. (Team Mascot) bring the heat! (Opposing Team Mascot) can't compete! our defense is tough stuff. we're gonna cream the other team! It's time for the (mascot) to win it all! When teaching middle school cheers, remember that it's better to teach just a few cheers with tight and precise motions and a well-projected voice than to teach a plethora of sloppy cheers. Many middle school cheerleaders will want to learn new cheers every week, but remind them that they'll have a better chance of making the high school cheer squad if they learn excellent form in middle school.